Summary: Under the thumb of the Yuan Dynasty, the Goryeo King is pressured to either produce an heir or name his cousin the Crown Prince. The King's true love, however, is his chief bodyguard Hong Lim, and he has never so much as touched the Queen. The King instead asks Hong Lim to sleep with the Queen, believing his problems to be solved as long as a son can be produced. But Hong Lim and the Queen's sexual encounter marks the beginning of a dangerous and passionate triangle of forbidden love, jealous rage, and heartbreaking betrayal. 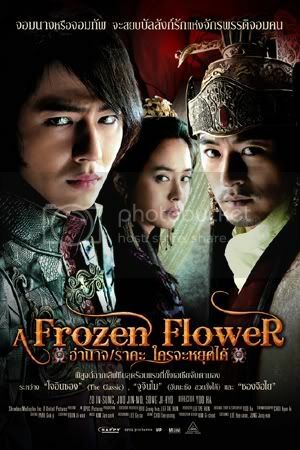 BUY "A Frozen Flower" DVD with English Subtitles! yg di screenshot yesasia sih itu judulnya apa??? ?